Hello my dear friends. Last year before Halloween as well we have created the imitation of a nail in a finger. However this imitation was less realistic, as it was hard to believe that finger had been bandaged before the nail was pierced it through. In today’s video we are going to make it more complicated. 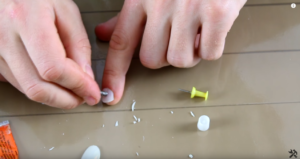 The imitation will be more realistic, the nail won’t go through the middle of a finger, but it will go through a nail. So I think that it will look more terrible and interesting. In order to make this imitation we need scissors, one short and small nail, which I’ve cut in two pieces before, a small drill, it’s better to choose a drill with the equal diameter of a nail to make construction more safe. 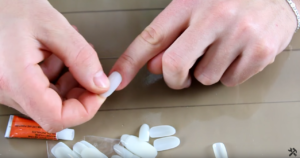 We also need one-use or artificial finger nails, I don’t even know how to call them. When I was buying them, there were the same packs, but without glue. However, I was told that super glue may be used instead of this glue. Finally, we need black and red paint, I’m going to use gouache, and some gelatine. We are going to use it in order to make a kind of grume. Black and red paint we need to blend it and get a dark cherry color, which remind blood. First of all we have to choose an appropriate nail. I’m going to make this imitation on the point finger. So, pick a nail and match it. In fact, I’ve picked a suitable size at once, so let’s move to the next stage. 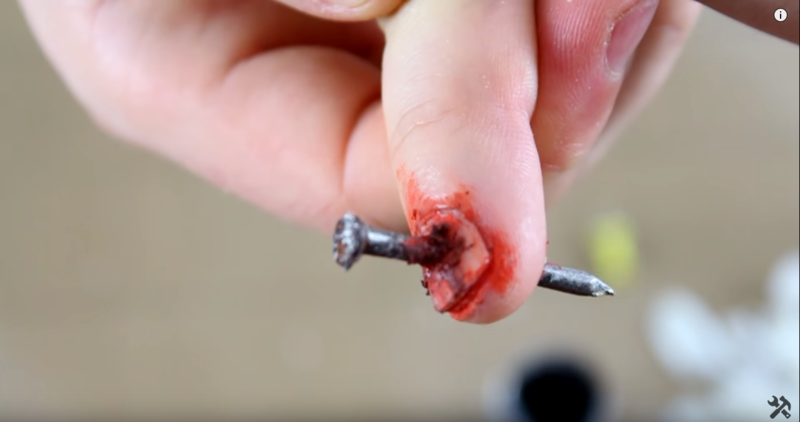 After picking a nail, take drill and make a through hole in it. As the nail is very thin, it’s possible to make a little hole in it with just a drill, without using a borer or a screwdriver. 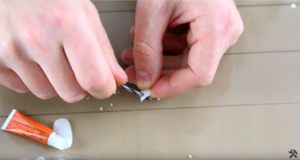 After we made a hole we have to stick the nail with the glue. Apply some glue. By the way, it smells like super glue. And stick it carefully. I hope I’ll be able to remove this nail, otherwise I’ll get such a manicure. 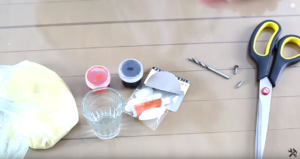 Then, take scissors and cut the unnecessary piece, but if you are a girl, you may stick all the artificial nails and it will look cool, especially, if you cover them with nail polish. Well, we have stuck the nail, let’s move to nail. Apply some glue on it. I recommend to use super glue, as it won’t be hard to remove it under hot water afterwards. But I think that this rubber glue won’t do. Then, we insert the nail into the hole we made before. Well guys, this glue won’t do, I’m going to take super glue and mend it. 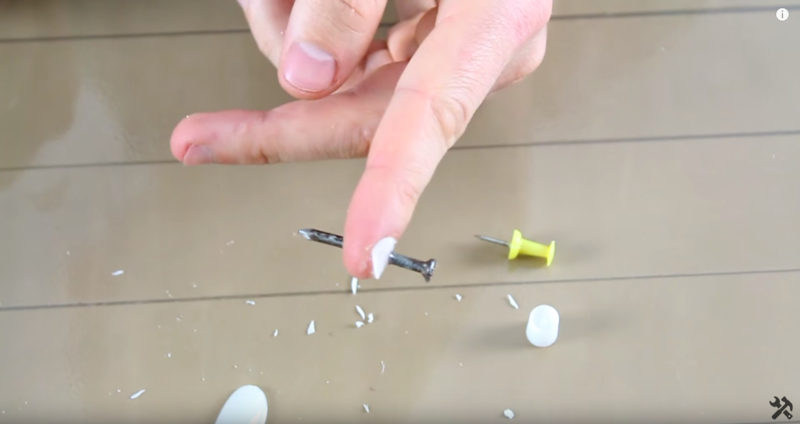 So I took super glue, put one drop, and then stick the nail. Hold it to let it dry. Here you can see that this is super glue, but not that rubbish, which is sold in this kit. Take a second part of the nail, apply a drop of glue, and stick it at the bottom. It looks so cool, guys! Now we just have to make an artificial blood. I’ve got a glass with a few drops of a tap, put some gelatine on the spoon, mix it with the skewer, and add gouache. Well guys, the imitation is ready. The only thing that betrays us a bit is an artificial blood, If you create an ideal mixture, it would be great. That’s all for today. Thank you very much for your attention. Don’t forget to estimate the video, comment and write your suggestions of what you would like to see in the next video. Bye-bye everyone! Halloween – the most commercially beneficial holiday after Christmas.